I live a stone's throw from about 225 acres of protected woodlands and often find remnants of felled, charred trees on the trails. The charcoal logs have a complex and fragile texture that intrigues me. Their burn patterns seem both spontaneous and mathematical, and their deep black surfaces almost sparkle. I took a couple of wood turning classes and found myself wishing that I could turn charred logs, but they crumble at a mere touch. I had recently started working on my birch collection, and it occurred to me that I could turn charred wood if the "wood" was clay instead. I focused on forms—including bowls, cups, and vases—that you might expect to create on a lathe. The vessels are wheel-thrown or hand-built white porcelain, sponged with thick layers of black slip for a slightly coarse finish. 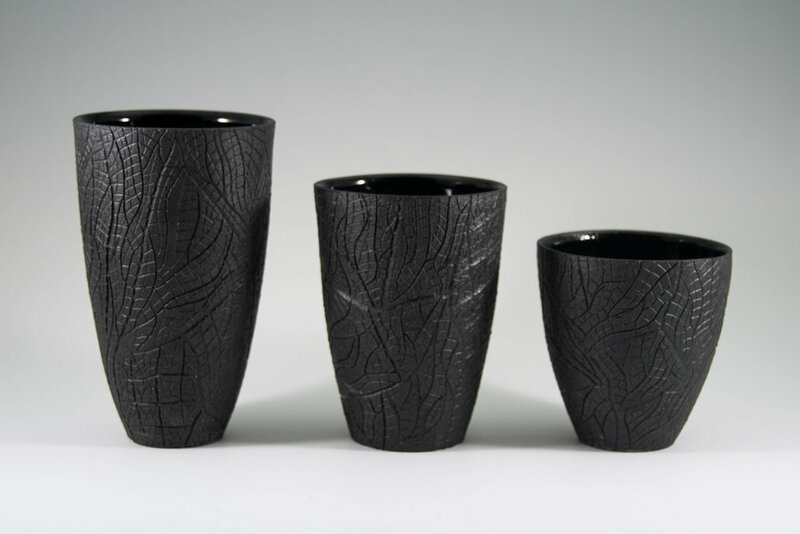 Each line of the burnt surface is hand carved at varying depths and angles to create intricate layers of texture, then filled with a black underglaze wash for a rich charcoal tone. I leave the exterior unglazed so that when fired, you can feel the rugged charred bark in your hands and enjoy its striking contrast with the smooth obsidian interior. Please click on the images below for a larger slideshow and more details on each piece. You can find more on my process and inspirations on my about page.